Romantic 1940s bungalow in historic downtown Nevada City. A perfect place for a weekend getaway, or longer term stays. Welcome to your home away from home! Step inside the handmade gate and up a few steps. Close the gate and come into your own private world, your own house and large yard. Inside, come into the kitchen, which has all the amenities, such as a gourmet Jenn-air range. There's an eat-in nook with a table and benches handmade by the owner, who is a woodworker and guitar builder. Come through into living room: with leather sofa, overstuffed leather arm chair and lounge chair and watch a movie from our selection or bring your own, to stay warm and cozy with a gas fireplace. The master bedroom (it's small, but lovely) has a queen bed, down comforter, a large closet, and goes through to the bathroom, which has both shower and bathtub. There's also a small second bedroom with a double bed. The whole house has lovely light from dawn until dusk. The floors are original Douglas Fir. There are skylights to let in light and ambient radiance. and yum -- warm radiant floors in the kitchen and bath! Outside, there is a large redwood (reclaimed wood) deck with an ozonated hot tub, and plenty of room for lounging. The barbeque has seen many a fine meal cooked on it, and it's great to hang out on the deck while cooking and enjoying a glass of wine. The yard is completely fenced for privacy while in the hot tub, and has a good view of the stars. The front yard has a small pond with waterfall, and an enormous wonderful old sycamore tree for a super relaxing space. There is parking behind the gates for two cars or a trailer, and also plenty of parking on the street. This house is the only one on the block so no one else ever parks in front -- we've had seven cars out there before! It's great if you have skiing or other equipment to park behind the gates and feel secure about it. We use all eco-friendly cleaning products! For sheets and towels as well as cleaning, for sensitive people. The owners are both well-known local musicians and artists, and have taken care to lovingly restore and improve this bungalow with lots of handmade details themselves. Wherever possible recycled and reclaimed materials have been used. Also special attention to green building and eco-friendly techniques have been given in order to promote sustainability. Walk to town to restaurants, shopping, and live theatre and music, or visit the nearby Yuba river with hiking, swimming and kayaking. Many street festivals and farmer's markets happen throughout the year and are great fun to walk to, whereas other people have to fight the parking for the big events. For example, all summer there are several local farmer's markets on Friday and Saturday, and the Summer Nights (a huge street party every Wednesday in July) ; Halloween always has lots of celebrations and costume events; in winter, there is the Victorian Christmas street fair with local arts and food for the Wednesday nights of December and the last Sunday before Christmas. There are several restaurants of very high quality downtown, and we are always happy to give recommendations. Drive only 30 minutes up scenic Highway 20 in the winter for skiing in the Tahoe/Donner region to be fully into the Sierras. Or just hang out in the hot tub and stare at the stars, make a dinner, and have a romantic getaway in a beautiful place. We would love you to enjoy our house, which we have lived for many years in and had many happy times. And we have lived in Nevada City for a long time, so we can offer you many insights and recommendations into the town and the region. Just ask! The owner grew up in San Francisco and has lived in Nevada City for over 25 years. He and his partner currently run a small organic farm just outside of town. We fell in love with this property right away due to the location and the sweet calm energy of the house. The family was raised here and it was lovingly lived in for many years before being shared as a vacation rental. We love sitting out in the hot tub on the deck looking at the stars, or reading the morning paper on the front porch in the hanging chairs. It is an easy walk to town to get just the right amount of exercise. Small but cute bathroom with toilet, sink shower and tub. Excellent on or off-street parking. With gourmet cook stove and lots of cooking supplies. Handmade table in the kitchen nook seats 4 comfortably. Stereo with iPod docking station, radio and CD player. Huge outdoor deck with seating for outdoor dining as well as hot tub. Radiant floors in the kitchen and bath. Due to concerns about the Smart Meter near the hot tub, guests will be happy to know we have replaced it with an analog meter. If only we had more time to hang out in the Bungalow, it was just charming, so comfortable and clean! The beds were good, and deck would be amazing in the summer. Really enjoyed having the hot tub, probably stayed up way too late because of that. For a comfortable, peaceful getaway, I would absolutely return. loved the short walk to downtown! Great home base for exploring Nevada City. Very clean. Only improvement we could suggest was to have coffee available. She graciously worked with me,, holding the property a few days until my son and his fiance could travel and take advantage of the reservation. They hsd a great time, and we were very pleased with the transaction. I understand from my son that the house itself is lovely! The property is private, clean, quiet, with an overall calming energy. Hosts let my partner and I do our own thing, but were readily available when needed and very kind. We hope to be back! Very agreeable place, quality and comfortable, at a walking distance from downtown NC. Spent a long weekend with my girlfriend in this "Romantic Artist's Bungalow in Downtown Nevada City. We loved the place very much, for its privacy, quite, good taste in every details. Even though it was a rainy weekend, we still enjoyed hot-tub and going out to the lovely downtown. Very happy to have chosen this place, I would recommend it to anyone looking to spend a nice and romantic "fine settimana" in Nevada City. 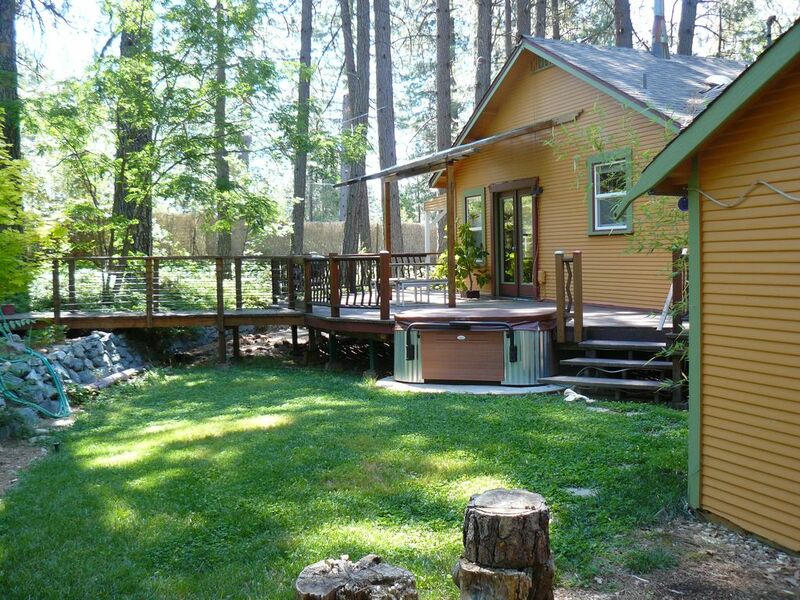 We have been staying at this lovely bungalow every time we visit Nevada City. This is at least our fourth visit at Nevada city and the place is always well maintained. This year, the owner has added a few additional furnitures for outside. Rates are subject to change before reservation confirmed. 10% occupancy tax is in addition to the nightly fee. Cleaning fee is in addition to nightly fee: Minimum $80 and increases depending upon number of guests and length of stay. An extended stay of 7 or more nights requires interim housekeeping with fee. $20 additional fee per night for each guest over two. $250 refundable damage deposit and rental agreement.